1960 was a good year for Sophia Loren. She made a huge splash starring in Vittorio de Sica’s Two Women, a role which won her an Oscar for Best Actress. 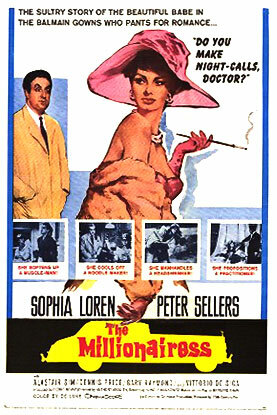 Then, as if to counter the intensity of that performance, she appeared opposite Peter Sellers and de Sica himself in a ridiculous film adaptation of a George Bernard Shaw play called The Millionairess. In it she plays the eponymous Epifinia, a temperamental spoilt brat who has inherited her father’s fortune – this, of course, was back in the days when a million pounds actually meant something. But the one thing that her money can’t buy is love. The diagnosis is that she has an Oedipus complex and he has a mother fixation. In order to cure themselves they agree to undergo marriage tests set by their influential parents. He has to turn five hundred pounds into fifteen thousand in three months and she has to survive on just 35 pence for the same duration with nothing more than the clothes she is wearing. Up until this point we have been treated to an outrageous array of outfits supplied for our leading lady by the French couturier Pierre Balmain and selecting the items that will bear her forth into the world of poverty provides another marvellous opportunity for more. In fact, the frocks become increasingly bizarre until Loren resembles a nun who’s taken up Thai temple dancing. Obviously this provided some much needed light relief after the drama of her previous film but it is probably something that the ever-glamorous Italian might wish she’d never taken on.